In the 1590s, life as a Huguenot in France was tenuous. Daniel Mignot, a trained goldsmith, must have felt this acutely, for he left his native France and re-established himself in the city of Augsburg, in present day Germany. While Augsburg offered him the religious freedom to live openly as a Protestant, the city’s laws prevented Mignot, as a foreigner, from practicing his craft. Mignot turned to printmaking as a way of showcasing and disseminating his innovative designs for jewelry. It also proved to be a lucrative form of generating income. Between 1593-6 Mignot produced approximately one hundred plates of engraved designs for jewelry and enameling. Among them was a series of eight designs for pendants featuring Christian imagery of the Temptation of Adam and Eve and the seven Virtues: Prudence, Justice, Temperance, Courage, Faith, Hope, and Charity. The prints were so popular that in 1616 the well-known engraver and publisher Jan Theodor de Bry (1561 – 1623) reprinted the series. Mignot’s prints are remarkable for the way in which they meld real and fantastical imagery. Detail of Pendant Design with The Temptation, plate 1 from the series Pendants with the Virtues. 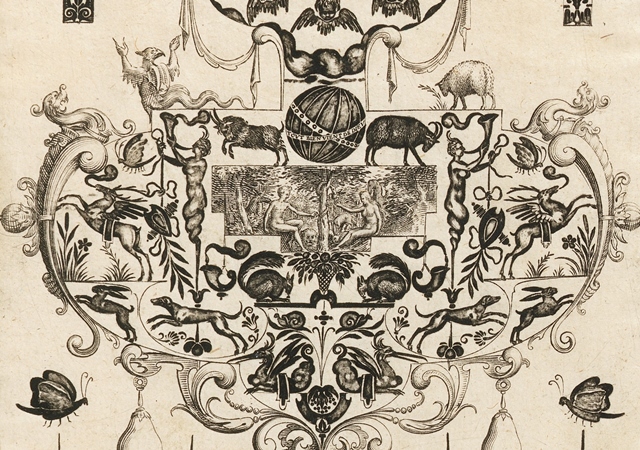 In the first plate from the series seen above, depicting Adam and Eve, the figures are surrounded by animals rendered in such detail as to be familiar, even if they are an amalgam of parts. Squirrels, rabbits, sheep, snails, goats, rams, and butterflies keep company with winged deer, women whose bodies taper into the tails of snakes, bushy-tailed birds, and a devilish-looking serpent with the arms of a man and the head of a bird. With his breathtaking attention to detail, Mignot, here by the hand of de Bry, transports us into the magical realm of the Garden of Eden, and the luxurious world in which such a pendant might have been imagined. The popularity of Mignot’s designs might well be attributable to the remarkable decorative quality of the prints themselves, rather than for their intended use as source imagery for jewelry design. Each sheet features not only a central pendant, but also independent designs for ornament that fill the otherwise unused space of the page. Mignot, and later de Bry, employed two entirely different styles of engraving to simulate different modes of decoration. The pendants are presented as sculptural elements, adorned with dangling, pear-shaped pearls and sumptuously encrusted with jewels, all rendered in engraved linework. The surrounding designs for enameled jewelry, including designs for the sides and tops of rings, are showcased in blackwork, a relatively new technique that had emerged in printmaking less than a decade earlier. In engraving, blackwork refers to the technique of deepening the surface of a copper plate to enable large areas to print in a rich, saturated black. Mignot may have chosen to use blackwork to suggest champlevé. Print: Pendant Design with The Temptation, plate 1 from the series Pendants with the Virtues, 1615–23. Designed by Daniel Mignot. Engraved by Jan Theodor de Bry. Museum purchase from Drawings and Prints Council Fund, 2001-22-1-1.